From New York Times bestselling author and star of the Oprah Winfrey Network’s hit show Iyanla: Fix My Life, an illustrated workbook of affirmations for self-healing and exercises for personal exploration, perfect for teenagers and young women. You are special. You are precious. You are It! Today, Iyanla Vanzant is a bestselling author with her own business and a loving family. But it wasn't so long ago that she was a teenager—a sixteen-year-old mother and high school dropout on welfare. Iyanla knows that a young woman's journey can be lonely and hard. She remembers how difficult it is to put into words the way you feel, how it feels to want to be loved. 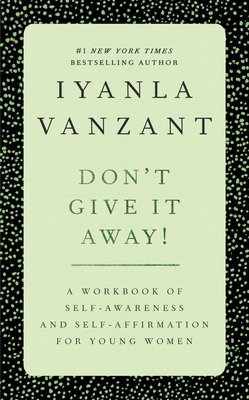 In Don't Give It Away!, Iyanla presents a workbook in which you can write your feelings and express your thoughts about the things that matter to you—your family, your friends, your body, and your love life. Problems at home and at school are a natural part of every young woman's life, but understanding what to do with how you feel about your problems is the key to growing up. Iyanla Vanzant shows you that the love you seek is the love that you are.